Beijing has several shopping districts offering a mind-boggling variety of goods. China Highlights tours offer great flexibility to allow for shopping time, with ABSOLUTELY NO SHOPS on our itineraries unless specifically requested. The Peking glass snuff bottles are a traditional Chinese handicraft with a history of about 200 years. They are popular in China and abroad for their unique workmanship and exquisite artistry. The snuff bottles are made of special materials, such as jade, and have a unique shape. Ones painted on the inside are particularly famous and admired by collectors. They are also called reverse painted due to the technique. Most of the paintings inside the bottles are Chinese style, with vivid pictures, simple colors, and elegant layouts, giving them a great collection value. The famous Eight Treasures inkpad was invented in 1683 and made by the Zhangzhou Stationery Factory. It is known for bright, unfading colors and very clear, fire and sunlight proof prints. It has a variety of usages, including signing important contracts and historical records. It is also a must-have for painters and calligraphers. The Eight Treasures Inkpad is made from musk, plum, cinnabar, vermillion hue, natural jade, and special oils. The entire process consists of around 30 stages, and maturing takes 6-10 months before the inkpad is finished. The Beijing Dough Toy is a traditional Chinese folk handicraft, which became popular in the beginning of the 21st century. The dough toy is made of wheat and sweet rice flour, and with a small bamboo knife the artist shapes the dough skillfully into people and animals in a short time. Among the figures are beautiful princesses, adorable children, and various historical people. The dough toys are small, making them one of the best souvenirs. As it is an ancient handicraft, tourists can find them at temple fairs during the Spring Festival. Famous blue glaze cloisonné is a unique traditional handicraft of Beijing, the origin of this type of cloisonné. It can be traced back to the Yuan Dynasty about 1,000 years ago, and became popular during the Ming Dynasty. It can be said that the blue glaze cloisonné is a collection of all traditional Chinese handicrafts, as one piece represents copper, porcelain, and traditional painting and sculpture arts. Products range from temple tablets, hall screens, and chairs to chopsticks, earrings, and toothpick holders. The traditional shopping districts have always been Wangfujing Street, Qianmen Street, Dongdan and Xidan Commercial Street, but now Jianguomen Outer Street and Chaowai Street have risen to the top in terms of having the latest and most luxurious items. Shopping at outdoor markets remains a not-to-be-missed experience for foreign travelers. 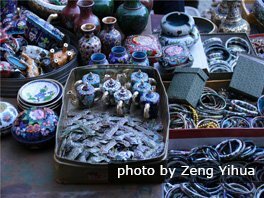 Check out Panjiayuan Collection Street, Xiushui Street, and Liulichang Street for local specialties such as cloisonné, jade pieces, lacquer carvings, antiques, and fresh water pearls. 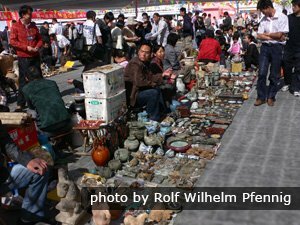 Panjiayuan Antique Market is the largest antique market in China, and the cheapest antique market in Beijing. 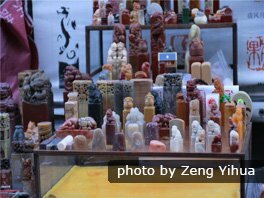 In Panjiayuan Antique Market tourists can find various collectables, such as antique furniture, ancient paintings and books, jade, porcelain, ancient and foreign money, bamboo carvings, Buddhist keepsakes, folk clothes, and cultural relics. Beijing Curio City is the largest antique exchange center in Asia, and a paradise for collectors and antique lovers. It is also an art gallery for tourists, to enjoy Chinese culture. 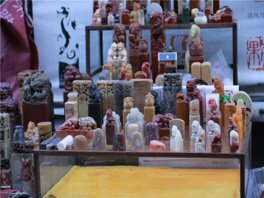 Beijing Curio City covers an area of 26,400 square meters and holds more than 600 traders, selling ancient furniture, calligraphy and paintings of famous people, jade sculptures, etc. Liulichang Street is named after a factory that produced glazed tiles right here in ancient times. It became a famous traditional cultural street during Qing Dynasty, when people from all over the country gathered here to attend the imperial exams. Over the years the street has become a center for cultural products. Presently, there are around 100 shops. They typically sell ancient paintings and calligraphy, books, writing brushes, ink sticks, paper, ink stones, collectively called the Four Treasures of Study. 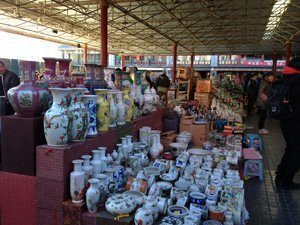 See Best Antiques Markets in Beijing. Beijing&apos;s Ruifuxiang Silk Clothes Shop opened in 1893, selling silk, wool fabric, cotton cloth, fur, and Chinese style clothes. Clothes made to order are the specialty of Ruifuxiang, famous for their materials and great tailoring. Here, tourists can choose the fabrics and wait for the clothing to be made. Transportation: Take city bus line 1, 4, 10, 104, or 803, and get off at Wangfujing Street. 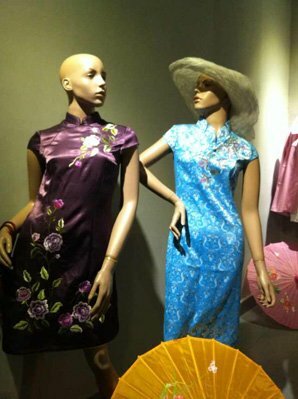 If you want to buy a Qipao, see Where to Buy a Qipao or Have One Tailor Made in Beijing. 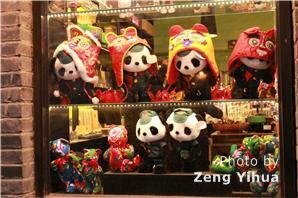 Shengxifu Hatter Shop at Wangfujing Avenue is one of the most famous shops in Beijing. It opened in 1911 and many famous people have supposedly ordered hats here, including Chairman Mao and Premier Zhou. Shengxifu also sell hats to the U.S., Germany, France, Canada, and Singapore. Subway Line: Take subway line 1 and get off at Wangfujing station. Neiliansheng Shoe Store is the largest handmade shoe-making company in China, famous for its cloth shoes. The headquarters has a Qing Dynasty style layout with yellow tiles and red pillars, reminiscent of the image of a bustling ancient shop. Neiliansheng Shoe Store was founded in 1853 to make shoes for officials. The Chinese character "Nei" stands for the government while "Liansheng" means "getting promotions". Therefore, all officials wear these shoes as a way to pray for a promotion, and this is how the shoe store got its name. Transportation: Take city bus line 1, 4, 10, 104, or 803, and get off at Wangfujing Station. Qianmen Street is located to the south of Tiananmen Square. 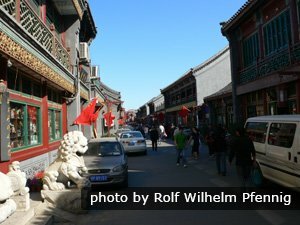 It is Beijing&apos;s original commercial center from 600 years ago; today, it largely deals in Chinese traditional products. This is a good place for souvenirs, such as stone or jade chops carved with your name. 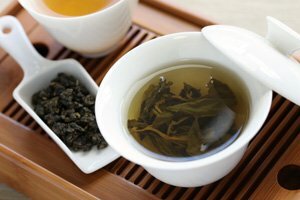 The Lao She Teahouse is located to the west of Qianmen Street, and is a good place to sample Chinese teas, read, or watch a traditional show. Xiushui Street has a silk market (open 9am to 9pm) brimming with some of the finest silk products, as well as an amazing array of name-brand clothes and bags, such as Reebok, Adidas, and Gucci. Xiushui Street is also one of the few places in Beijing where foreigners can purchase clothes and shoes in larger sizes. The fun of the place may not come from searching for the perfect bag, but from the haggling. "No price is fixed" is the golden rule here. The more you haggle, the better price you get, even 30 percent of the original price. Beijing Sanlitun Village Flagship stores for many famous brands, especially sports brands, are in Sanlitun Village. It is very popular among Beijing young people as well as tourists. Transportation: Take bus 103, 104, or 420, or subway line 1, and get off at Wangfujing Stop. 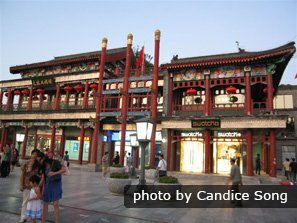 Beijing Xidan Shopping Center is on the bustling Xidan Commercial Street, a famous center with 70 years of history. This market covers a range of prices levels by providing middle and high quality commodities. Many new shops like Xidan Shopping Center, Xidan Bazaar, Chung-Yo Department Store, and Huanan Mansion have recently been launched. Many world-famous, name-brand products are available, making Xidan a paradise for shoppers. Transportation: Take bus 22, 37, 47, 105, 109, or 826, or subway line 1, and get off at Xidan Stop. 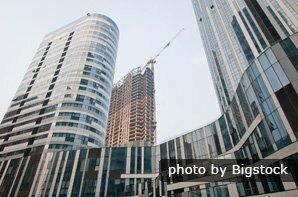 Known as "China&apos;s Silicon Valley", Zhongguancun is Beijing&apos;s high-tech center because of its many universities and IT-based companies. Markets sell every kind of computer part that you can imagine. The Zhonghai electronic market sells used computers, parts, and notebooks, and second-hand parts sell at low prices if you do not require the latest model. In addition, many markets offer reasonably priced computer repair services. Maliandao is in the southwestern part of Beijing. 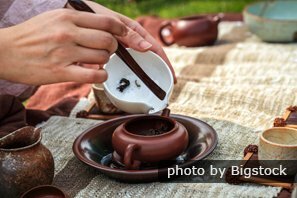 The street specializes in anything associated with tea, including teacups, teapots, and tables and, of course, many different types of tea. Our Beijing tours include free time in the evenings for shopping. Our tours will not take you on un-scheduled shopping detours. See our ABSOLUTELY No Shopping Guarantee. If you would like the assistance of our guide (for translating, recommendations, and help with getting the right price) and private transport for a Beijing shopping trip let us know and we can tailor-make your tour. Contact us. 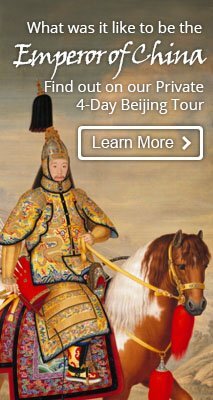 4-Day Essence of Beijing Tour — See all the top sights in this classic Beijing itinerary, constantly updated to customers&apos; preferences. 8-Day Golden Triangle Tour — Our year-in-year-out best-seller covers the must-see sights in Beijing, Xi&apos;an, and Shanghai. Ideal for a first trip to China. Where to Buy or Tailor Make a Qipao in Beijing?